Stresa is a town of about 5,000 residents on the shores of Lake Maggiore on the south side of the Alps, in the province of Verbano-Cusio-Ossola, located in the Piedmont region of Northern Italy, about 90 kilometres (56 mi) northwest of Milan. Since the early 20th century, its main source of income has been tourism. The climate is quite mild year-round, and the water temperature ranges from 15 to 22 degrees Celsius. The name of this town first appeared in documents in AD 998. In the 15th century it grew into a fishing community and owed feudal allegiance to the Visconti family. It subsequently came under the control of the Borromeo family. 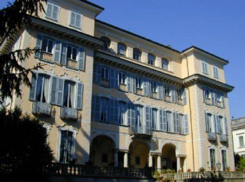 For centuries Stresa has been a retreat for Europe's aristocrats, who have built a number of villas in the town. In 1948, the American author and journalist Ernest Hemingway visited the town. He had set part of his 1929 novel “Farewell to Arms” in the Grand Hotel des Iles Borromees. In 2002 Stresa hosted the 10th International Hemingway Conference. The town is also the venue for the "Settimane Musicali"; an international classical music festival which is held annually in the summer. Regular boat services from the town's two docks provide access to the nearby Borromean Islands. Borromeo Palace has been built on Isola Bella over the centuries. It is a sumptuous and fairy-tale building, the splendid Italian-style gardens on the outside, the succession of lavishly decorated rooms inside are an irresistible attraction for tourists all over the world. The works were started by Carlo III Borromeo (1632), who entrusted them to the Milanese engineer Angelo Crivelli, assisted by other artists such as Pietro Antonio Barca and Francesco Maria Ricchino. Towards the middle of the century the shipyard suffered a setback due to the plague epidemic that raged in the Duchy of Milan. Only in the last decades of the seventeenth century the works resumed with renewed enthusiasm thanks to the son of Carlo, Vitaliano VI. In reality, however, the Palace can be considered finished only in the immediate post-war period, when Vitaliano X (1892-1982) completes the northern façade, the large pier at the upper end of the island and above all completes the construction of the Salone on the basis of drawings and of the large wooden model made in 1871. The aspect that was wanted to give to the island, that is a vessel on the waters of the lake, was pursued and brought to completion despite the protracted work: the Isola Bella complex (consisting of the Palazzo and the enchanting Italian gardens) looks now elegant and harmonious as a whole. The palace was built on the north-western tip of the island and is characterized by an imposing facade about 80 meters long in the center of which the hall of honor develops like a curved projection, occupying two floors in height. The structure then extends towards the center of the island perpendicular to this portion assuming in the whole the shape of a T.
The main rooms are all on the first of the four floors that make up the building and wind around the Salone, whose dome cover and decorations have been completed, based on the original design, only between 1948 and 1959. The noble floor, an environment for reception and representation, houses the neoclassical ballroom, also called "Sala delle Colonne", the "Sala della musica" which owes its name to the precious musical instruments on display, the "Sala delle Medaglie", where ten gold wooden medals are kept representing the most important events of the life of San Carlo Borromeo. Also on this floor is the Gallery of the Tapestries where are kept six precious tapestries of the 16th century Flemish manufacture: its barrel roof is decorated with rosettes of gold on a white background. In ancient times, for the entertainment of owners and guests, there was also a theater, later destroyed, where comedies and dramas were performed. Finally, very interesting are the artificial caves (accessed via a seventeenth-century helical staircase) decorated in such a way as to evoke marine environments. In one of the rooms there is a prehistoric pirogue, found in Angera at the end of the nineteenth century. Villa Pallavicino is surrounded by beautiful garden with the intent to preserve the natural environment spontaneity of Lake Maggiore. It is a favorite tourist attraction, a paradise of flowers and animals to delight visitors of all ages. Enclosed in an environmental and landscape setting formed by immense park, the lake and one of the most celebrated panoramas around the Verbano, Villa Pallavicino expresses and sums up the charming and accomplished the ideal of the ancient residence on Lake Maggiore in the 800. Founder and first scorer of this mansion was Ruggiero Bonghi, a friend of Manzoni and Rosmini, who had fallen in love with the pristine beauty of Lake Maggiore. It was later acquired and expanded from Villombrosa Duke and in the year 1862 it was bought by the Marquis Pallavicino, who are still the owners today. The particular structure of the park, allows visitors to truly be "in contact" with nature as it allows you to bring any animals which live free in large natural spaces. In the Farm in fact, adults and children can pet various animals including Deers and Llamas in space without bars and in complete safety or even walking through the botanical garden you will find peacocks roaming free. Within the beautiful natural environments reconstructed you can observe different species of exotic birds including splendid examples of parrots and flamingoes, while near the pond you can find Water Turtles and Swans. Isola Superiore, also known as Isola dei Pescatori by the historical work of its inhabitants, is located further north than Isola Bella, from which it is separated by an islet that is more or less the size of a rock and is known as "La Malghera". 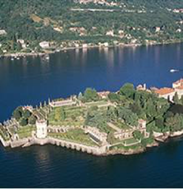 With its 100 meters of width and 350 meters in length, Isola del Pescatori is the smallest of the Borromean Islands (the largest is Isola Madre). Unique among the Borromean islands to be inhabited during all the months of the year, it hosts a small village of fifty inhabitants characterized by a small square enclosed by narrow and sinuous alleys that lead to the promenade on the northern tip of the island. Features are the multi-storey houses built to make the most of the little space available: they are almost all equipped with long balconies essential to dry the fish. As clearly indicated by the name, the activity of fishing is still very practiced, and it is possible to taste the freshest fruits in one of the many trattorias with lake view. The history of the island is ancient: we know it was inhabited as early as seven hundred years ago. The parish church is dedicated to San Vittore: in mid-August during the procession the statue representing the patron saint is transported by boat around the islands. Characteristic is the small market that sells local crafts and attracts many tourists. You can reach the island by the public service boat or private launch from the boat stations of Stresa, Arona, Verbania and Baveno. Isola Madre is the largest and perhaps most characteristic of the three islands in the Borromean Gulf. Its palace displays furnishings from the historic residences of the Borromeo family, and contains some beautiful rooms, such as the Dolls’ Room, the Room of the Seasons and a room devoted to the Puppet Theatre. The atmosphere of this enchanting place is magical; its immense garden of rare trees and exotic flowers, where peacocks and pheasants wander and budgerigars fly in freedom, has something of the fascination of a tropical land. The English-style garden of Isola Madre, landscaped in the early 19th century in a space of almost eight hectares, displays a flora which is a continual surprise and which is hard to find in other places. It is famous for the amazing spectacle of its azaleas, rhododendrons and camellias in flower, as well as its pergolas of ancient wisteria. The largest specimen in Europe of Kashmir Cypress, superb lime and lemon trees, a marvellous collection of hibiscus, and a Gingko Biloba, are all found here. Isola Madre leaves you with a memory of manicured lawns, expertly tended trees and flowers, and beautifully laid out interiors, of a quality to please the most exacting visitor. Villa Ducale is the oldest mansion in Stresa, it was commissioned by Bolongaro family and built in 1770 on the lakefront. Giacomo Filippo Bolongaro, member of the family, embellished the villa until his death in 1780. In the Napoleonic era the villa was separated from its garden due to the construction of the Sempione road. The last descendant of the Bolongaro family, Anna Maria, invited the philosopher Antonio Rosmini to set up the first male elementary school that was entrusted to the Rosminians. For the esteem and gratitude that bound her to Rosmini, she ordered that after her disappearance, which occurred in 1848, the ownership of the villa passed to the philosopher. He lived there in his last years of life and could boast among his distinguished guests Ruggero Bonghi, Niccolò Tommaseo and Alessandro Manzoni. In 1857 and for the next fifty years the villa became the holiday resort favored by the Duchess of Genoa, Princess Elisabeth of Saxony, wife of Ferdinando, Duke of Genoa and second son of King Carlo Alberto. It was during this period that the house, called Palazzo Bolongaro, took the name of "Villa Ducale" and became one of the favorite meeting places of European nobility. When the duchess disappeared, the villa knew several owners until it was acquired in 1942 by the Rosminian Fathers. Completely remodeled in the post-war period, it is today the headquarters of the International Center for Rosminian Studies, a museum dedicated to the philosopher and an important library with authoritative texts from the biomedical field. The Church of St. Ambrogio has a Greek cross plan and neoclassical facade adorned with two sculptures of musician angels. It was erected in 1790 on a design by Giuseppe Zanoia da Omegna. Inside there are three altars: the one on the left is decorated with a precious painting by Morazzone depicting the Crucifix and Saints Charles, Francis and Anthony. The main altar, in the center, is surrounded by seventeenth-century paintings dedicated to Sant'Ambrogio and finally the altar on the right holds the mortal remains of San Vitaliano, the little martyr who, in the early age of ten months and twenty-eight days, was snatched from his family by the anti-Christian ferocity of the Romans. 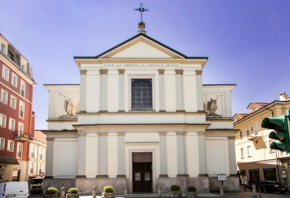 In 1833 his little body was extracted from the catacombs and Pope Gregory XVI welcomed the desire of Anna Maria Bolongaro to transfer it from Rome to the parish church of Stresa, where since 1835 it is revered as a protector of children. The parish church of Stresa has always been the scene of important historical events, as well as the town of Stresa. In August 1912, for example, in the presence of his daughter Margaret, queen of Italy married to Umberto I, was held the funeral of Elisabetta di Sassonia, Duchess of Genoa, for fifty-five years resident in the beloved town lake. Speciality cured meats include the mortadella of the Ossola (under the protection of the Slow Food organisation), the raw ham and violini di capra (cured goat’s leg) of the Vigezzo Valley. To complement these delectable hams and salamis, the locally produced wines are perfect: full-bodied reds like Ghemme Docg and Nebbiolo from the Novara hills, Prunent and Neuv Bruschett from the Ossola valleys, or the wines of the Angera area. There are many weekly markets found throughout the week. Most of the stalls at these markets contain souvenirs and imported clothing, but you can find also some gems produced from local artists and craftsmen. This is also the place to find artisan food from the area and products from the local farms. On Tuesday there is a market in Ascona at the Piazza G. Motta. A great market for food products is on Saturdays in Belinzona at the Centro Storico. Locarno has a market every Thursday at the Piazza Grande, and the largest market on the lake is at Luino on Wednesdays. Verbania has a market near the ferry dock on Saturdays. The factory for one of the most famous and popular tableware and kitchenware manufacturers, Alessi, is near Lago Maggiore in the town of Omegna. You can visit the factory outlet to get items at discounted prices. The items come in all shapes and sizes, and you can find funny items, elegant items, and more. The store is open all days except Sunday, from 10am to 5pm. 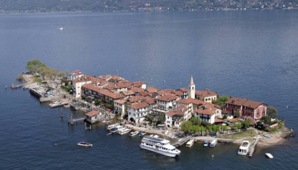 The town of Stresa in the Lake has several boutique stores as well as chain brand stores. Benetton Lingerie and Benetton have stores in town. You can find a bookstore at the Piazza Cadorna. Any of the deli shops in town stock a great selection of cheese, cold meats and other local products. There are two large shopping centers found in Gravellona Toce. They are directly opposite from each other, and you can find many discount stores such as Melablu and Oviesse. Bata shoes is also here, and other stores sell jewelry, electronics, home wares, sportswear and kitchenware. There are more shops in Gravellona Toce and several supermarkets. In Arona there are several larger shops and discount outlets. One such discount outlet, Sergio Tacchini, sells sportswear and leisure wear. Just follow the main roads and you will drive by the shopping districts.